Creping is one of the most important process in the tissue machine, and it plays a vital role in improving product effect and tissue paper quality stability. 1. Equipment have the angle adjusting device. 2. The blade pressure is suitable with surface combine of Yankee. 3. Optimize the intensity of doctor blade to eliminate the vibration. 4. Rise blade and add pressure with pneumatic components to operate safely. 5. There are several kinds of oscillator be served according to equipment location space. 6. It is quick and safe for changing blade. 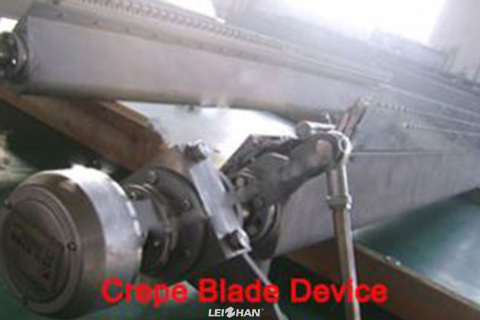 Creping doctor blade manufactured by Zhengzhou Leizhan Technology Paper Machinery Co., Ltd are of superior quality, good performance and high efficient. We can provide you with competitive price. With more than 30 years’ development, our paper machine and pulp equipments have won lots customers from all over the world. Cooperate with us is your wise choice. If you have any need, please feel free to contact us. Welcome you to come and visit!